Kerala Lines is a new entrant (not really) in the field. Travel Centre - a fairly old Thrissur based agent - operates Kerala Lines. They've been operating weekend specials from Bangalore to Kerala since quite some time. They were handling the services of Shama Transport from Kerala earlier, then moved over to operating some other operators. 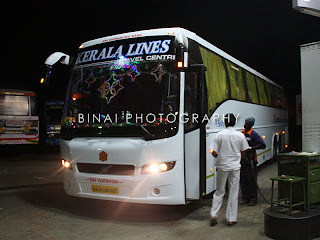 A couple of months back, they started operating two new Volvo Multi-Axle buses to Pathanamthitta. The white beauties kept attracting quite often, but since I've not been traveling often these days, the opportunity to try them kept eluding me. Meanwhile, the service gained popularity and started getting really great reviews. My chance to try the service came in the form of my Niece's birthday celebrations at my home town. Not wasting any time, I got a seat blocked from the Travel center office in Bangalore. So it was Kerala Lines for my next Thrissur-Bangalore journey. 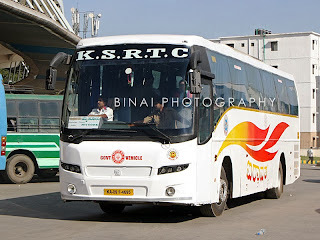 Sometime during Dussehra, Karnataka SRTC came up with a new Airavat service to Thrissur via Mysore. This bus curiously starts from Mysore Road Satellite Terminal at a very awkward 3pm, reaching Thrissur at an even awkward 1AM. The timing is no different in the opposite stretch. This service made me quite curious. The website did not give any clue about the route it takes beyond Mysore. But the running timings somewhat gave me a clue that this could be via Gudalur-Nilambur. Some days after the bus got running, I got information that the service is operated by Mysore depot! Now that was something quite interesting. I thought I must try this service once. But I travel very rarely these days, and I did not see an opportunity in the near future to try the service as well. Sometime later, I so turned out that my Niece's first birthday is to be celebrated at our hometown - and that was on a working day. This was the chance - sure!